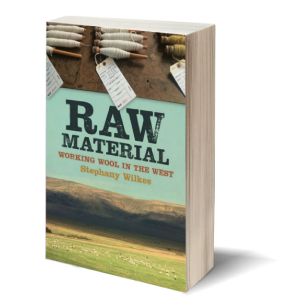 Six years into shearing, I could not only tell people what to do with their wool, but they could get it done locally, affordably, and quite easily. That didn’t used to happen. I need the glimmers of “That didn’t used to happen.” Without them, I am too easily lost in the land of “Why bother?” On hard days, after a six-month-long shearing slog, one more 300-pound, sticky sheep seems too big to shear, and the toxic textile system too big to change. A couple of weeks ago, I spent an hour in an REI store. My family was visiting and wanted to buy a few things they’d forgotten to pack. Standing in the women’s wardrobe area, comprised almost entirely of synthetic fibers that, somehow, still managed to get an “eco” tag slapped on, I felt depressed and dejected. Whatever “normal” is, of course, is simply the result of a series of certain human choices. We are not bound to those choices. We can make other ones. But I, for the moment, was surrounded by the choices we’re not making. I think nothing of feeling bad about things. That’s normal, the guilt (which comes from a conscience) over our daily sins that simply existing creates, whether it’s carbon emissions, microplastic shedding from doing our laundry, toxic dyes and formaldehyde finishes, the slave labor we know but cannot see, a full day’s flight away from our searching eyes, the belching container ships whose flags have nothing to do with country of origin. Things are this way, even though we don’t want them to be this way. We did not choose, but nonetheless have. I think nothing of feeling bad. It’s the feeling good that gives me pause. 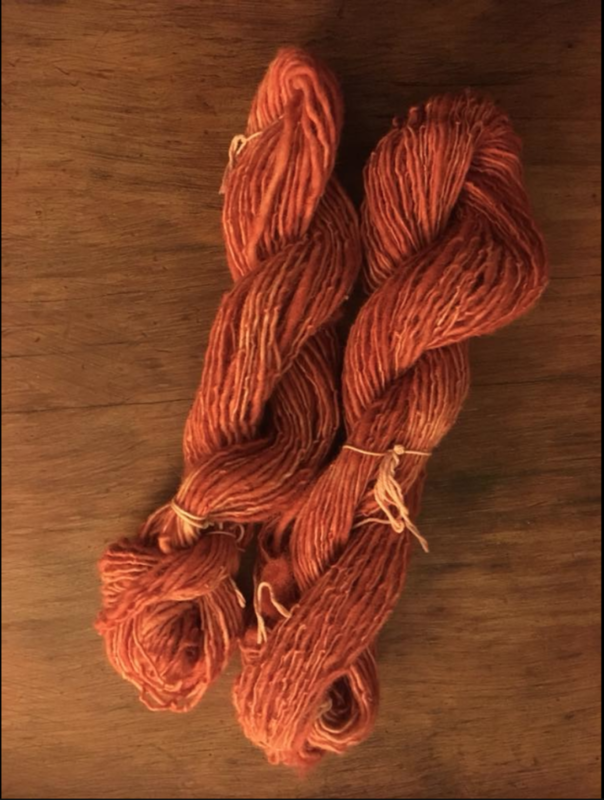 Her caption read: “First experiment with natural dye. Handspun wool dyed with home grown madder root.” Jenifer had the wool scoured and processed into roving at Mendocino Wool & Fiber, the same place I’d driven fleeces from my shearing job. That beautiful, gleaming skein had come from those happy, dirty shearing days? Days like this didn’t used to happen, so it is really something when they do. And it was. That day, we had 100 or so pregnant, Friesian ewes, plus a dozen or two Suffolk. Rain streamed off the eaves outside, creating that perfect smell of rainy soil air. The bright green hills were not yet gold brown, not yet to burn. The owner herded sheep into the poly tunnel out back to keep them dry for shearing while, inside, the piles of wool grew ever higher as we sheared through ever thicker manure and mud. Jordan and I were relieved to have Jenifer and Zoe’s help. Their presence alone would have been enough, because shearing can be lonely. They were utterly competent and so helpful, Zoe more so than many adults, moving sheep onto the plywood, choosing and moving the next sheep from the pen, keeping the sheep moving along and out of the area after shearing. We all enjoyed a satisfying Mexican dinner after our first long day of work. That day, with all its joy and loveliness, is wrapped up in those two skeins of yarn. Each beautiful person is right there in it, because they all harvested and produced it. This, perhaps, threatens on preciousness, on putting too grand a point on things, on making mountains out of molehills. But as my wise friend Jack says, feeling good is enough. It’s not smugness so much as plain appreciation for this beautiful, useful object, and the craft of all the beings that brought it into being. That skein and the local mill, there for the driving to, did not used to exist, and their existence is critical proof that they can. So I will say, with joy, “That didn’t used to happen” as often as I notice, and as often as I can. Folks love stories of so-called Shrek sheep, found God knows where with years’ worth of wool growth (and living proof that sheep do not “just shed” their wool if left alone in nature).But, as a shearer, those stories used to create nothing but dread. “Poor sheep,” I’d shudder to think. “It’s probably wool blind. And imagine what’s hiding in that fleece! Barbed wire, bottle caps, stuff that your shears turn to shrapnel.” No thanks. It is no accident that the most experienced shearers are called upon to shear Shrek sheep. Years’ worth of heavy wool pulls the sheep’s membrane-thin skin away from its body, making it much easier to cut than usual. You’ve got to learn sometime, and this year was it. And, as with most things related to livestock, my fear had blown it entirely out of proportion. 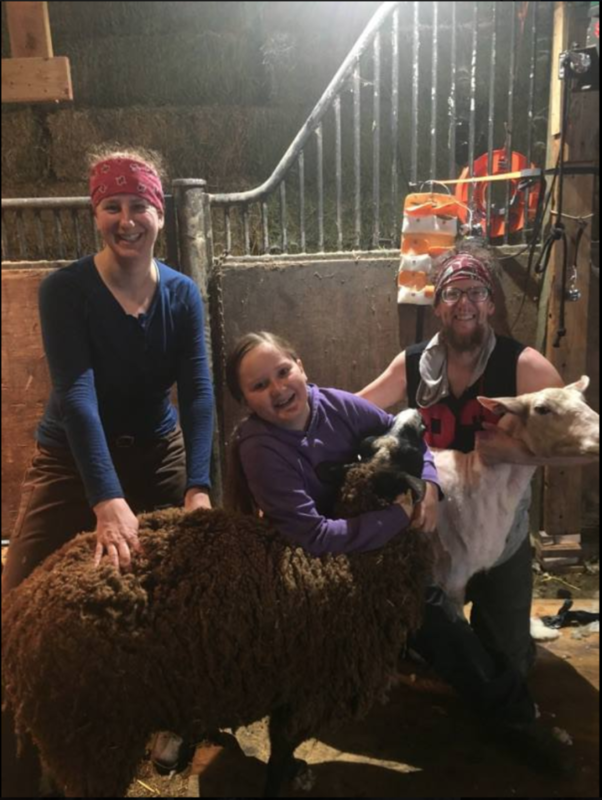 I thought I’d share what I’ve learned about shearing sheep with years’ worth of wool growth, and help beginner shearers who end up in this situation for the first time. My shearing partner, Jordan, displays a completely felted sheep fleece, several years’ worth of wool growth. This is from a small sheep. If you take your time, you’ll be fine. Slow down and own it. I make a practice of saying “This is going to take me a while,” both to set expectations and to give myself permission. Do not discount your rate. Not even if you’re a beginner. That sheep (and its owner) needs you more than you need the tricky work. It is fair to charge more for sheep in poor condition, which include Shrek sheep. There is a greater risk of cuts and nicks, they require more shearing time, and they use more equipment, in that you have to swap combs and cutters more often than you do for regularly sheared sheep. You’ll go through a cutter every 1-2 sheep, and the same or similar for a comb, vs. getting 2-4 sheep per cutter and 3-7 sheep per comb. These are costs you bear, and you should pay yourself fairly for them. As a ballpark figure, I would not shear a sheep with multi-year wool growth for less than $10-$15/head, after the ranch call, certainly $12-$15/head for a ram with that kind of growth. Many years of wool can be very heavy. If a sheep produces a 7-12 pound average fleece every year, and hasn’t been sheared for three years, it is carrying 21-36 pounds of wool. Sheep have very thin skin, so that kind of weight pulls and stretches the skin up as you shear the wool away. I wish I’d worn a Go Pro or something this year so I could show you what I mean, but I didn’t, so let’s go to Imaginary Shearing Land (via the Mister Rogers trolley). We’re shearing the neck. You do one stroke, and the wool from that stroke falls over to the side (away from your shears, over the sheep’s shoulder that you’ll shear next). You’ll see the just sheared wool (helped along by gravity) pulling the skin away from the sheep’s body, and lifting the skin right into the way of your shears for the next stroke. If you forge ahead as is, you’ll cut that lifted skin: the just sheared wool is lifting it right between the teeth of your comb. Damn and blast. I adapt by holding the wool down with my left hand, and shearing with my right. My left hand is at the outermost part of the fleece, putting all of that wool between my hand and the sheep’s body, and between my hand and my sharp, fast, dangerous shears. I hold the wool against the sheep’s body, from the outside, and basically shear underneath it, being very mindful to not cut my hand. I check the sheep’s skin and hand piece position with every stroke and adjust accordingly. I hope this makes sense. You’ll see what I mean, in any case. Multi-year wool has often felted right on the sheep’s body. This solidified wool makes it difficult to find a safe, clean spot to lay the comb on the sheep’s skin and get started in the proper place, at the proper angle for comb bevel and teeth. A pair of hand scissors really comes in handy. You can safely and slowly cut wool away by hand, until you’ve created clean purchase for your hand piece. I always feel better and calmer when I’ve set myself and my shears up properly, which gives me the best chance for shearing safely and well. Bring hand scissors if you don’t already. I can’t say it enough. Add them to your kit. They’re wonderful for safely cutting wool away from the sheep’s face, too. Use normal equipment, but more of it. I do not use 9-tooth combs. I’ve sheared sheep with multi-year growth just fine with my usual 13-tooth combs. Indeed, I’d be more leery of using a 9-tooth comb for Shrek sheep, as that lifted skin would fit too easily in the larger space between the teeth. No bueno. You’ll need more oil, more often, and Kool Lube spray too. After a year or more without shearing, lanolin can dry out, harden, and/or get absorbed by the extra wool. There is less lanolin, literally less oil, to help your shears glide along. This is even worse in cold weather. Your shears may also run hotter than usual, pushing through more wool with more gunk in it. Keep everything well oiled and as cool as possible. I hope this helps somebody out there. Just take your time, all the time you need. If you had told me I’d end up in Vogue, and for sheep shearing no less, I’d have called you a liar. But there it is. Vogue: Women of the Wool. Photos by Nich McElroy. I am so grateful to this esteemed publication for showing where our clothes come from, and for telling the world about the most wonderful people I know, who do things like run into sky-high fires to save sheep, and offer to drive four hours to come get you out of snowstorms in the Sierra, and so much else besides. I love them in a way I can scarcely convey. How did this happen? I certainly did not call Anna Wintour and say “So I’m shearing some sheep this weekend… You busy?” No, this is what happens when Robert Irwin, of Kaos Sheep Outfit, calls you and says “What are you doing Saturday?” And you say “Shearing sheep.” And he says “What about Sunday?” And you say “I’ll be having my first day off in six months.” And he says “No, I need you to come shear my sheep.” And you say “NO.” And he says “It’s a photo shoot for Vogue!” And you say “Well that’s a new one” and show up to shear, even with a torn scapula, because the man deserves an A for effort plus bonus points for cleverness. I swear, I thought that man was fibbing until the camera came out. The photo of my feet beside Carrie Butler’s makes me cry, because she’s my shearing sister and we’ve been through the wars together, since day one of shearing school. This is quite a day for my people and our craft. Thank you, Vogue. And, just like that, May. I do not know the last time I did not work a weekend, which was not the point of quitting my day job, I’ll have you know. The idea was to shear more on weekdays. The frenetic pace of life, the death of someone close to me every single month of this year (save this month, so far, knock on wood), and caring for a cherished friend with cancer, has pummeled me. How did anyone make it through the AIDS crisis, which was so much worse? Grossly overfed, obese sheep have pummeled me, too. While shearing some of these miserable, gagging, wheezing beings two weeks ago, I hurt my left shoulder. It felt partially dislocated, my left arm suddenly weak, painful and rather useless. I asked another shearer to take one of my scheduled jobs while I healed and, as soon as I felt a bit better, promptly sheared again. Now I’ve really gone and done it. There will be no shearing for a few weeks. I want to shear sheep long term, for as much of my life as I’m able, which means I need to heal in the short term. Because I could not stop for deaths, my body stopped for me. Today is the first time I have paused in months. And I need to, because I have work to do. A long to-do list has grown since January, holding all of the work to do when I’m not working. I could not face it. It was too overwhelming and I too depleted. But the pile of clothes in the sewing room that needs mending, that I could face. And not only could I face it, I could genuinely enjoy it. I love sewing and knitting but, as a self-avowed anti-consumerist, feel incredibly guilty if I make something I don’t need. (I’m great at ruining things for myself.) And, like most Americans, I don’t need anything. I could go years without buying a single new item of clothing or pair of shoes and still not wear out every single thing I already own. My compromise is to focus on making things my husband and I do need. I knit a lot more socks than I used to, and I’m knitting him a traditional gansey on size 2 needles. That will keep me occupied for a nice long while. I also need clothing for warmer weather. San Francisco has a pretty mild climate but, like the rest of the world, we have a lot more hot days that feel like L.A. than we used to. That means sewing things like linen tunics and cotton dresses, maybe knitting a linen summer sweater, and taking time with the details: trims, better seams. Jeans require solid sewing effort, too, and those we actually wear through. But mending, mending requires no excuses. 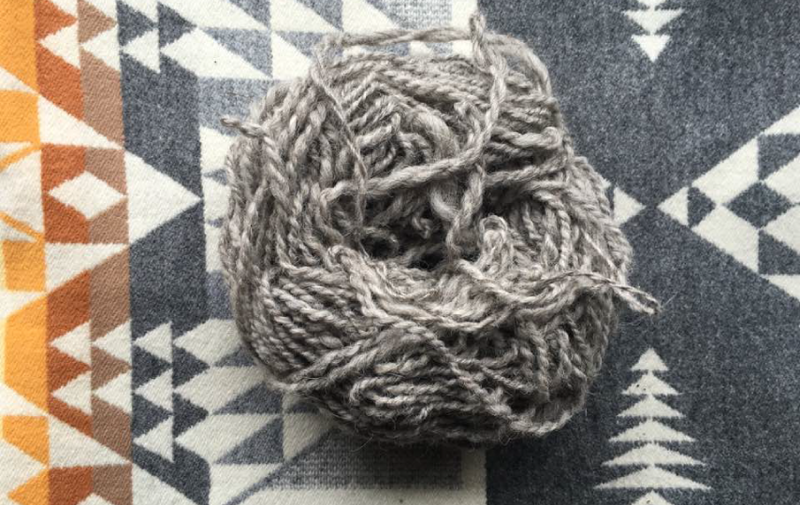 It is not ethically problematic and is almost instantly gratifying, better even than knitting a dishcloth. Herein lies the problem with pure Merino: It’s soft. Too soft. So soft that it not only pills easily, but breaks. I can’t complain too much. I purchased this sweater quantity of yarn for a song, not even $60, if memory serves. Even at Black Sheep Gathering, folks apparently weren’t interested in undyed, black Merino and the seller wanted the yarn gone. I happily knit it up and it fits great: regardless of what this rip might imply, this sweater fits perfectly in the shoulders. I was quite miffed when I went to put it on and noticed The Hole. Now, I only wear these shearing and in the garden, so I’ve got no one to impress, but why not apply a little scrap of sock yarn? Then I was on a role. I hand sewed some separating seams on two summer shirts I sewed last year, and used my trusty dish-soap-and-peroxide combo to remove mud stains from a very old sweater of my husband’s, which also has a few tiny holes in it. I plan to try a trick I heard from a friend, in which she took fusible interfacing, put it behind tiny, moth-made sweater holes, and steamed and stretched a delicate knit fabric together right on top of the interfacing. She swears the tiny holes are now invisible. Clever! I may attempt visible, or artful, mending too, which I found while searching for mending tips and techniques. I love that, on the Internet, just about anything you find is a trend or a subculture to someone. I found Tom of Holland and his Visible Mending Programme, in which he makes mending visible to encourage more sustainable relationships between our garments and ourselves. I found the The Ardent Thread (I hope to get into her mending class soon), beautiful mending inspiration at Wishi Washi Studio, and The School of Gentle Protest. And I feel better than I did this morning. I think I will also try to fix my hair dryer, with its noisy loose ball bearing from clumsy me dropping it. I figure it is a fairly low-risk endeavor since I hardly ever use it anyway. I cannot cure cancer or raise the dead, but I will fix the few things I can, and hope my shoulder fixes itself.